Note: This post is now a year and a half old, and nearly a dozen new papers are out. I've updated this post to include some of the recently published, exciting developments in Pacific Northwest marine vertebrate paleontology. 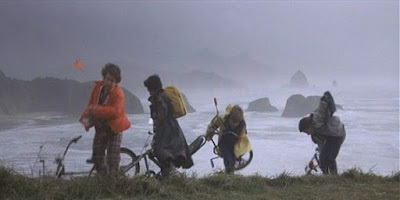 A scene from one of my favorite movies, The Goonies - with Haystack Rock (a Neogene igneous intrusion) and Cannon Beach in the background, and typical Oregon coast weather. Another famous sea stack at Olympic National Park in Washington. The Pacific Northwest - the "top left" corner of the United States (and British Columbia! ), if you will - is a land that most people will associate with The Goonies, grunge rock, good coffee, D.B. Cooper, Tillamook ice cream (and cheese), lumberjacks, tall trees, totem poles, sasquatch, and Cascade volcanoes. To vertebrate paleontologists like myself, however, the Pacific Northwest is a playground of discovery including some of the most spectacular and desolate coastlines on the continent, with magnificent redwood and pine forests marching right down to concretion-riddled rocky shores. Some of the earliest marine mammal fossils found on the west coast were discovered along the coast of Oregon - Pontolis magnus, a giant walrus from the Empire Formation of Oregon (Coos Bay) described in 1903, and the pseudo-sea lion Desmatophoca oregonensis, named in 1906 from the Astoria Formation near Newport, Oregon. Since then many prominent paleontologists and amateur collectors have scampered along the deserted windblown shoreline of the Pacific Northwest in search for Cenozoic marine vertebrates, such as Earl Packard, Douglas Emlong, Guy Pierson, Jim and Gail Goedert. I've done a small amount of fieldwork, largely constrained to Lincoln County, Oregon, Cape Blanco, Oregon, and the Eel River Basin near Eureka, California. Paleontological fieldwork in the Pacific Northwest is challenging - the maximum and minimum tides are more extreme than central California, the localities are often more isolated, it's usually far windier and colder - and I've been rained out of fieldwork along the Oregon coastline nearly 3/4 of the time. from the Astoria Formation, Oregon. With few exceptions (e.g. the Goederts and Bruce Welton), the story of marine vertebrate paleontology in the Pacific Northwest is dominated by amateur collectors. This is in stark contrast to the bulk of marine mammal material from central and southern California collected in the 1970s and 1980s, mostly collected by professional paleontologists and students on field trips from UCMP, LACM, and SDNHM. 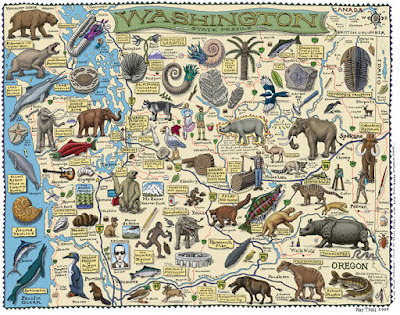 Unlike the California coast, which has many fossil sites conveniently located within an hour's drive of various large universities and other paleontological institutions, most of the fossil sites in the Pacific Northwest are a bit further of a drive. Coastal fossil sites need semi-constant monitoring, as erosion is rapid and new fossils can be exposed after every storm at some localities. At some fossil sites in central California, I preferred to visit them three times a year - winter, spring, and summer (erosion was slowest in the fall). As a result, the most successful collectors in northern California, Oregon, and Washington have mostly been amateur collectors or professionals able to go on long trips; being based nearby and with the ability to visit a locality often is key to collecting well in the Pacific Northwest. 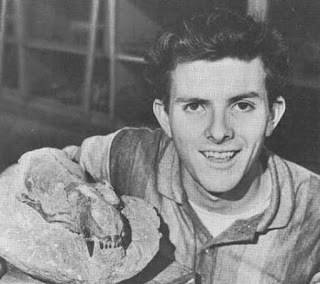 Doug Emlong - one of my heroes - is probably the most famous, a brilliant, gifted and admittedly tortured individual who amassed a spectacular collection of fossils from the Oligocene and Miocene of Oregon and beyond. Many new species, genera, and families have been named from his collection at the Smithsonian, and several have been named after him including Enaliarctos emlongi (a pinniped), Seuku emlongi (a desmostylian), Squaloziphius emlongi (an enigmatic dolphin), and Mancalla emlongi (a large flightless auk). 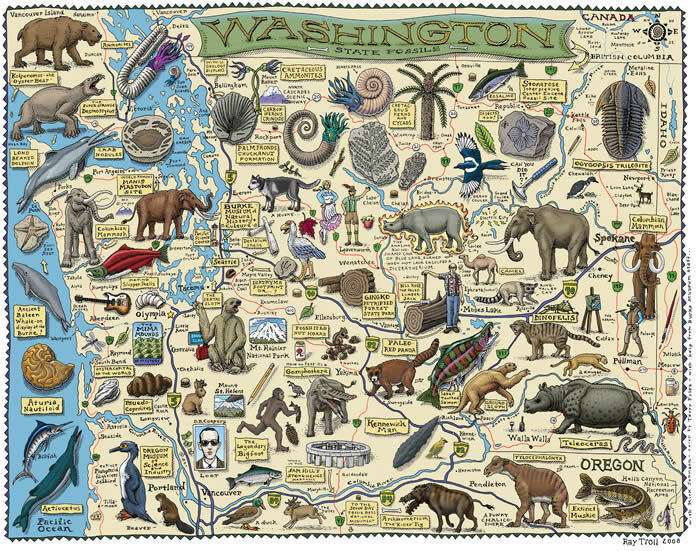 One of Ray Troll's famous maps - this one showing Washington and the Pacific coast; a much larger map is coming as part of Kirk Johnson & Ray Troll's sequal to "Cruisin the Fossil Highway", "Cruisin the Eternal Coastline". The well-sampled Oligo-Miocene Newport Embayment of Oregon and other regions such as the Olympic Peninsula have yielded large collections of fossil marine vertebrates that have answered all sorts of important questions regarding the origin of pinnipeds, desmostylians, baleen whales, dolphins, and the diversity of flightless penguin-like diving birds (Plotopteridae). Since I started this blog in 2008 I haven't posted quite as much as I would have hoped, and I've always wanted to write about some of the more recent advances in Cenozoic marine vertebrate paleontology from this fascinating area. It would take forever to chronicle the entire history of marine vertebrate paleontology from the Pacific Northwest, so instead I'm going to cover the really new, exciting research that's come out over the last ten years (e.g. the time in which I've been doing research on similar subjects). Teeth of sharks and bones and teeth of bony fish are typically the most common fossils in any marine vertebrate fossil assemblage. But, as explored in a previous post - for unexplained reasons - shark teeth actually seem to be quite rare on the west coast (with the obvious exception of places like Sharktooth Hill and the Santa Margarita Sandstone in Santa Cruz). Nevertheless, systematic prospecting by paleoichthyologist Bruce Welton during the 1970s resulted in large collections of teeth and other elements from various localities on the west coast, including Oligo-Miocene rocks in Oregon. Some of these were published in the 1970s and 1980s, but now that Bruce has retired from the petroleum industry he's gotten back into publishing and a flurry of papers has come out, particularly on some of the smaller fossils. Three of these are on basking sharks (Cetorhinidae). The modern basking shark, Cetorhinus maximus, is the world's second largest fish (second only to the whale shark), approaching the size of a minke whale (6-8 meters). Basking sharks are planktivores and as a result have developed "microdonty" - tiny teeth, and extensive mineralized gill rakers that function in filter feeding. Teeth and gill rakers of Keasius taylori from the Eocene Keasey Formation of Oregon. An Oligo-Miocene species, Cetorhinus parvus, was named based off of gill rakers from Europe - but wasn't known from teeth, and the use of the taxon was contested. 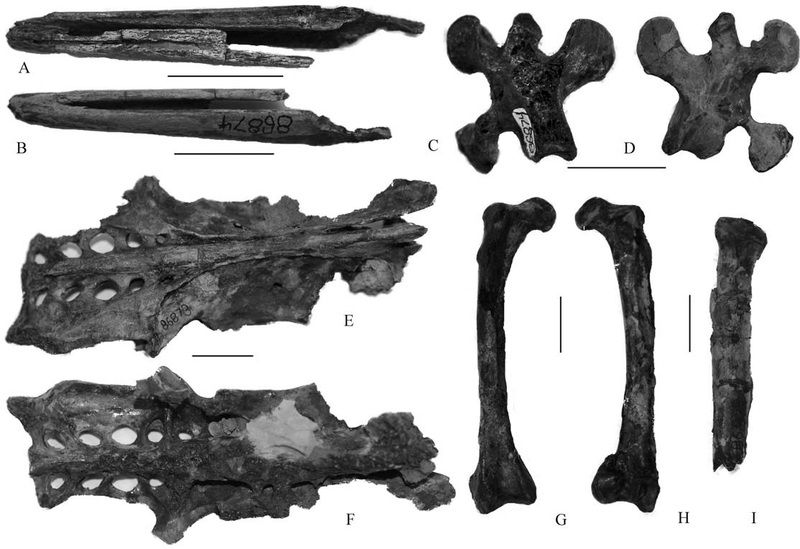 A new "skeleton" from the Eocene Keasey Formation of Oregon includes 22 teeth, fragmentary vertebrae, and gill rakers - and named by Welton (2013A) as the holotype specimen of Keasius taylori. The teeth are small, but much more primitive in their morphology and resemble mini-sand tiger shark teeth, and Welton hypothesized that the ancestral basking shark would have resembled a sand tiger. This and other fossils of Keasius taylori clarify the identification of previously reported mid-Cenozoic basking sharks, many of which are now identified as Keasius rather than Cetorhinus, and recombined the earlier described species as Keasius parvus. Vertebrae and gill rakers of Cetorhinus sp. cf. C. maximus from the late Miocene Empire Formation of Oregon. In contrast, a newly reported fossil specimen from the much younger (upper Miocene) Empire Formation of southern Oregon are very close to modern Cetorhinus maximus, and identified by Welton (2013B) as Cetorhinus sp., cf. C. maximus. This specimen includes gill rakers and calcified vertebrae; size of these elements indicates a shark ~4.5-6 meters in length. A third study of fossil basking sharks reports many isolated teeth of the new species Cetorhinus piersoni from the lower Miocene Astoria Formation of Oregon and Washington and lower part of the Round Mountain Silt in southern California. 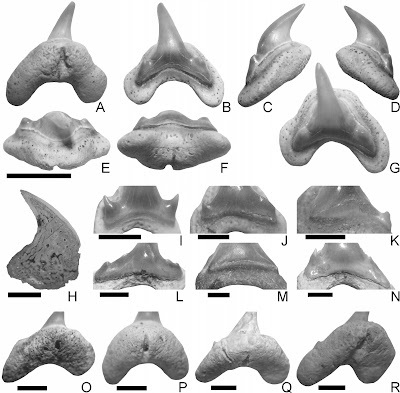 Teeth of Cetorhinus piersoni are reminiscent of miniature thresher shark teeth and highly variable in morphology, suggesting a combination of filter feeding and fish eating. The name honors Guy Pierson, who collected the holotype (who also collected the holotype of Pteronarctos piersoni). Teeth of the Oligo-Miocene megamouth shark Megachasma applegatei from the Jewett Sand of California. Yet another paper on planktivorous sharks is coauthored by Bruce Welton (Shimada et al., 2014 - written by partner in crime Doug Long and prolific colleague Kenshu Shimada) and chronicles an archaic megamouth shark from the Oligo-Miocene of Oregon and California. The new shark, Megachasma applegatei, is named after the well-known LACM based paleoichthyologist Shelton Applegate, and is named after a tooth from the lowermost Miocene Jewett Sand at Pyramid Hill (Kern County, southern California) and many additional specimens are referred from the Oligo-Miocene Skooner Gulch Formation of northern California and the upper Oligocene Yaquina Formation and lower Miocene Nye Mudstone of Lincoln County, Oregon. In other words, virtually every unit with marine vertebrate remains of late Oligocene-early Miocene age on the west coast has produced these distinctive teeth. They resemble modern megamouth shark (Megachasma pelagios) teeth but have lateral cusplets like mini sand tiger teeth. Interestingly, the earliest teeth of this taxon reported were figured and described in the mid 1970s, with the earliest specimens recovered from Pyramid Hill in the 1960s - long before the modern species Megachasma pelagios was accidentally discovered by an individual being caught in the anchor of a Navy ship off Hawaii. The megamouth shark was surprising as it was completely unknown by science, and such a large shark - up to 5 meters in length. The megamouth was discovered by scientists first from fossils, but unlike coelacanths, only by a decade or so in advance, and only then informally as it took until 2014 for Megachasma applegatei to be formally recognized by science. An associated dentition of Rhinoscymnus, from Welton and Goedert (2016). A series of three related papers were published by Welton (2016 and Welton and Goedert (2016) on squaliform sharks from the Oligocene of Washington and Oregon. These include Orthechinorhinus davidae, a lantern shark from the Alsea Formation of Oregon, Rhinoscymnus viridiadamas, a sleeper shark from the Lincoln Creek Formation of Washington, Somniosus gonzalezi, another sleeper shark from the Pysht Formation of Washington, and Oligodalatias jordani, a kitefin shark from the Pittsburg Bluff Formation of Oregon. Squalomorph sharks typically hang out in deep marine environments, and there is a marked shallowing of vertebrate-bearing sediments from the Oligocene to the Pliocene along the Pacific coast, meaning that at least in some taxa there is a shift in the sorts of marine vertebrates encountered (particularly fish). A partial rostrum of the billfish Aglyptorhynchus from the Oligocene Lincoln Creek Formation of Washington. Bony fish are also collected often from rocks in the Pacific Northwest. Bony fish are notoriously difficult to study owing to the multitude of bones in their skeleton (mammals are simple in comparison) and the rarity of complete skeletons. Faunal studies can be done but require extensive knowledge of a wide array of skeletal elements. Paleoichthyologist Harry Fierstine focused most of his career on studying one group of fish - the billfish (swordfish, marlins, sailfish) - from all over the world. 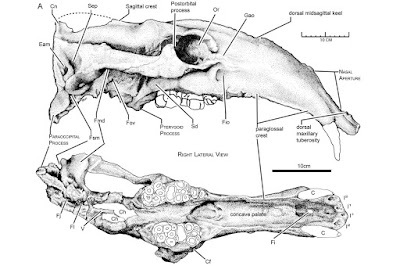 In 2005, Fierstine reported specimens of Aglyptorhynchus from the upper Oligocene portion of the Lincoln Creek Formation in Washington, including a partial skull, rostrum and jaw of the new species Aglyptorhynchus columbianus. A separate species, Aglyptorhynchus maxillaris, was named earlier by Fierstine from the upper Oligocene Yaquina Formation further south in Oregon. Another recent study by Bruce Welton (2015) reports the entire fish fauna from the Pleistocene Port Orford/Elk River Formation of southwestern Oregon; much of this fauna consists of otoliths - fish ear bones. Sea turtles are an uncommon find along the west coast, but are found on occasion. Sea turtles do stray into cold temperate waters - the leatherback Dermochelys strays as far north as the coast of Washington State - but the sheer majority of sea turtle fossils in the eastern North Pacific are from southern California. In 2009 Brinkman reported a skull of an indeterminate sea turtle in the tribe Carretini (loggerhead sea turtles). This well preserved skull - collected by Doug Emlong of course - constitutes the oldest record of the loggerhead tribe Carretini and the first record from the Pacific coast of North America. A skull of an unidentified loggerhead (Carretini indet.) from the early Miocene Nye Mudstone of Oregon. Quite a bit of research has been published very recently on fossil sea birds from the Pacific northwest. One of the bird groups I've actually published on is also one of the rarest - the bony toothed birds or pelagornithids. A few records of pelagornithids are already known from the Pacific northwest, including Eocene records (formerly identified by Goedert in the 1980s as Dasornis, but now Pelagornithidae indet. 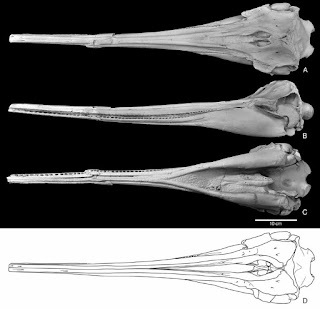 ), and several specimens of "Osteodontornis" (now known as Pelagornis) are known from the Emlong collection from the early Miocene of Oregon, but have never been described. A new study by Mayr et al. 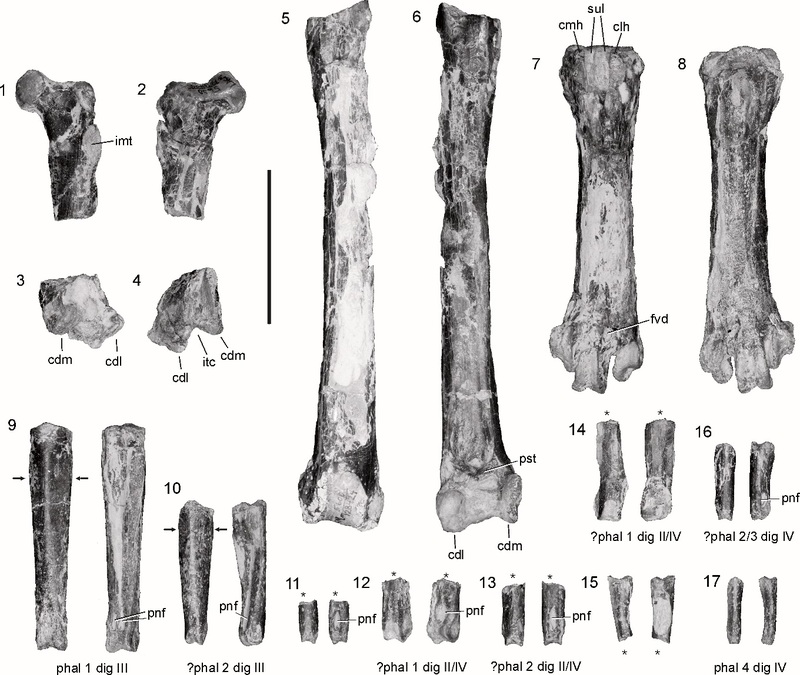 (2013) reports a new, well-preserved postcranial skeleton of the giant bony toothed bird Pelagornis collected by Jim Goedert from the latest Oligocene-earliest Miocene Nye Mudstone near Newport, Oregon. This skeleton includes many vertebrae, a synsacrum, and most of the hindlimb. The hindlimb morphology indicates that other mid-Cenozoic suspected pelagornithids Tympanonesiotes and Palaeochenoides with Pelagornis, and reiterate an earlier conclusion that all Neogene pelagornithids belong within the genus Pelagornis. A partial skeleton (hindlimb elements depicted here) of Pelagornis from the early Miocene Nye Mudstone of Oregon. The type specimen of Makahala mirae from the Makah Formation of Washington. A little gem of a bird skeleton collected by Jim Goedert was recently prepared out of a concretion and named Makahala mirae (Mayr 2015). This little bird hails from the Eocene-Oligocene Makah Formation and consists of a partial disarticulated skeleton including humerus, radius, ulna, and other forelimb elements. This is one of only two records of a fossil procellariiform (tubenoses: petrels, albatrosses, and shearwaters) bird from the Paleogene of North America (many shearwaters and albatrosses are known from Neogene rocks in California and the east coast). Furthermore, it has some strange adaptations in the wing, and may have used flapping more frequently than gliding (as is the case in diving petrels) as opposed to the majority of procellariiformes which are efficient gliders. The Astoria Fm. albatross from Mayr and Goedert (2017). In summer 2017, Gerald Mayr and Pacific Northwest "amateur" paleontologist Jim Goedert published some interesting albatross specimens from the Oligocene Lincoln Creek Formation and lower Miocene Astoria Formation of Washington state. The Lincoln Creek albatross was named Diomedavus knapptonensis, and represents a fairly plesiomorphic member of the Diomedeidae (the albatross family). The holotype includes a partial humerus, tarsometatarsus, and other elements. 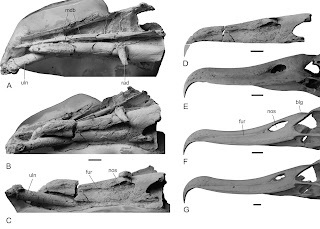 Additional fossils from the Astoria Formation include a spectacular partial skull (above) but critically lacks appendicular elements directly comparable with other fossil albatrosses, and is not yet named. These fossils indicate that early albatrosses inhabited the North Pacific during the Oligocene and early Miocene, living alongside the giant pelagornithids. 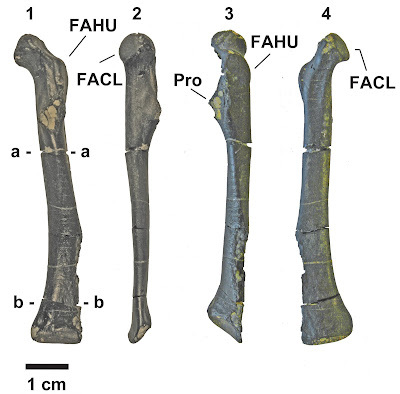 Aspects of the postcranial skeleton suggest that these early forms may have been more adept at terrestrial locomotion than (notoriously clumsy) modern albatrosses and other tubenoses. The type coracoid of Stemec suntokum from the Oligocene Sooke Formation, British Columbia. An incomplete and unassuming specimen collected recently by avid amateur paleontologist Stephen Suntok and his family from the late Oligocene Sooke Formation of Vancouver Island was reported by Kaiser et al. (2015). 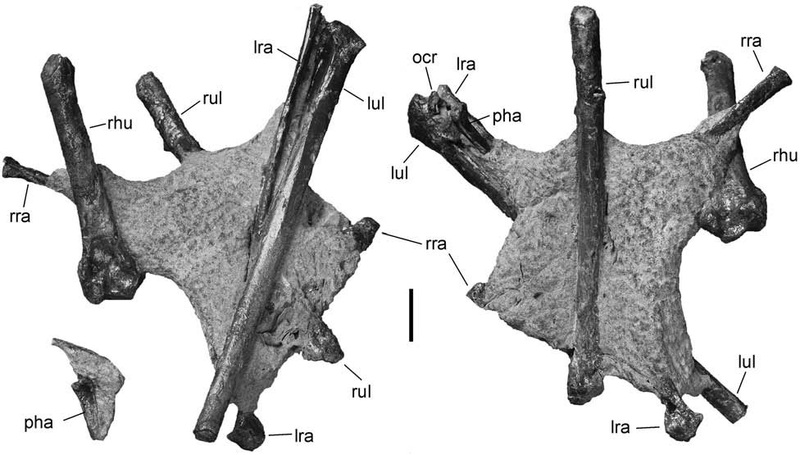 This specimen is an isolated coracoid of a flightless plotopterid seabird, which was named Stemec suntokum (Kaiser et al., 2015). Most birds have a flattened, wide coracoid but Stemec is unusual in being very narrow and rod-like. Another recent discovery is that of many more specimens of the plotopterid Tonsala hildegardae and the newly described Tonsala buchanani (Dyke et al., 2011). These new specimens of Tonsala from the Makah and Pysht Formations of the Olympic Peninsula indicate (collected by Jim Goedert) that plotopterids likely experienced similar loads on the hindlimb during terrestrial walking like penguins, but the wings did not, suggesting that Tonsala "flew" underwater in a fashion more similar to an auk or puffin than a penguin. Plotopterids have traditionally been placed within the "Pelecaniformes", now known to be a wastebasket grade, but nonetheless considered close to cormorants, boobies, and gannets. A provocative hypothesis by Gerald Mayr suggested that plotopterids may actually be most closely related to penguins, readily explaining away many of their similarities. A new study by Mayr et al. 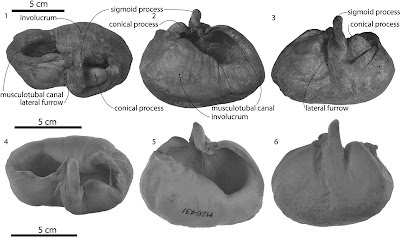 (2015) reports well-preserved plotopterid skulls (Tonsala hildegardae) collected by Jim Goedert from around the early/late Oligocene boundary within the Pysht Formation of the Olympic Peninsula in Washington. Cladistic analysis of bird relationships using these new specimens seems to confirm the traditional interpretation of suloid (gannet/booby) affinities, but also placed the penguins as the next group outside the expanded Suloidea. The plot thickens! Future work on plotopterids from the Oligo-Miocene of Japan is eagerly awaited. A number of excellent presentations at the 2016 and 2017 meetings of the Society of Vertebrate Paleontology indicate that some really exciting research is coming soon on these spectacular fossil birds. 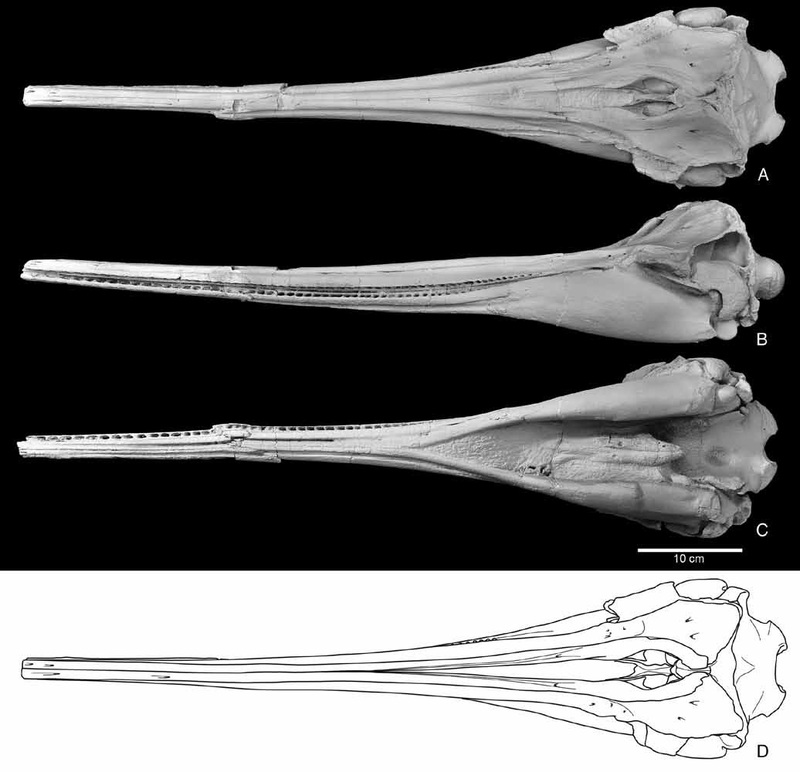 The skull of Tonsala (left) in comparison with a booby (B), cormorant (C), and a penguin (D). A beak and postcrania of Tonsala hildegardae, Pysht Formation, Washington. One of my favorite groups of marine vertebrates are the pinnipeds – seals, sea lions, and walruses. The oldest pinnipeds are recorded from the late Oligocene of the Pacific Northwest, and includes a number of well-preserved specimens of the harbor seal sized archaic enaliarctine seals – characterized by bear-like dentitions. Most modern pinnipeds are sexually dimorphic (males and females of differing sizes), with modern elephant seals, sea lions, and walruses constituting some of the most sexually dimorphic of all mammals. A recent study by Cullen et al. (2014) interpreted the available sample of the seal Enaliarctos emlongi (originally reported from the lower Miocene Nye Mudstone by Annalisa Berta in 1991) as reflecting sexual dimorphism. 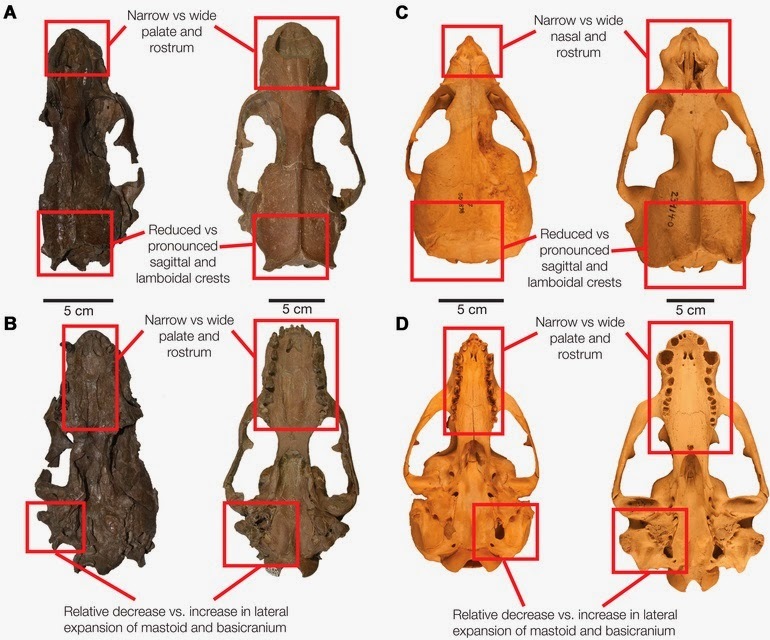 The holotype specimen is a male with a large skull, proportionally large canines, and a sagittal crest – whereas the putative female is smaller and has proportionally smaller canines. However, these authors only made limited comparisons in order to substantiate their identification and curiously made no comparisons with the diminutive species Enaliarctos mitchelli, which is also known from the Nye Mudstone. Sexual dimorphism in Enaliarctos and Arctocephalus. The Bushell specimen of Callorhinus gilmorei from the Plio-Pleistocene Rio Dell Formation of Humboldt County, California. Several other recent papers have focused on the fur seals and sea lions – the Otariidae. The first of these is a paper I published in JVP in 2011 and reports fossils of the northern fur seal lineage – Callorhinus. These fossils were collected from the Plio-Pleistocene Rio Dell Formation from Scotia Bluffs in Humboldt County California. The older (late Pliocene) specimen consists of a beautiful pair of mandibles in a large siltstone concretion identifiable to the Pliocene species Callorhinus gilmorei, also known from coeval rocks in southern California and Japan. This and other specimens of Callorhinus gilmorei have incipient fusion of the primitively double rooted teeth of earlier pinnipeds, whereas extant fur seals all have single rooted postcanine teeth. Further up near the top of the Rio Dell Formation (early Pleistocene) is a second specimen of an unnamed species reported preliminarily as Callorhinus sp. with mostly single rooted teeth except for a well developed double root on the lower molar – intermediate between C. gilmorei and the modern northern fur seal Callorhinus ursinus. This fossil record suggests that the Callorhinus lineage represents a circum-north Pacific population that has not budded into different species since the Pliocene – an evolutionary pattern known as anagenesis. The skull of the Pleistocene sea lion Proterozetes ulysses, Port Orford Formation, Oregon. One of the oldest fossil records of a true sea lion (Otariinae) in North America is Proterozetes ulysses, represented by a skull, mandible, and postcrania collected from the Port Orford Fm. in southwestern Oregon by none other than Doug Emlong in the 1970s and formally named by Barnes et al. (2006). Prior to being named, this sea lion was originally reported as an unnamed species of Eumetopias - the same genus as the modern northern sea lion. While I still agree with that generic allocation, Proterozetes curiously appears to be morphologically intermediate between the California sea lion (Zalophus) and Eumetopias in being relatively large with a short rostrum but possessing a large Zalophus-like sagittal crest. Barnes et al. (2006) originally reported the age as Pliocene based upon work from the 1940's - much more recent biostratigraphic studies and amino acid racemization put the locality as middle Pleistocene, approximately 700 Ka. As expected, no sea lions have been found in the intensely sampled San Diego Formation, suggesting a true absence of sea lions in the region until the Pleistocene. Ashley Poust 's Proterozetes mandible (left) and Ash desperately trying to maintain footing on gooey Pleistocene marine outcrops. 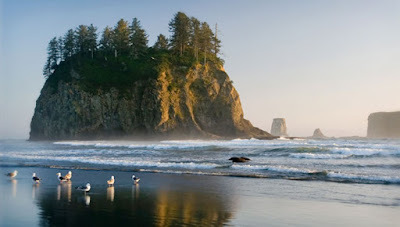 In 2009, Ashley Poust, Lee Hall, and myself - all students at Montana State University - took an epic road trip for spring break, driving to my hometown in California by way of the Oregon coast from Bozeman, Montana. We drove in shifts, leaving at 3am and arriving on the shore of the Pacific just in time for sunset - making it in about 16 hours (which was also a new record for me). I have done the drive solo in one shot before, but being able to pass out in the back next to the cooler and Ash's guitar was a substantial improvement. After cooking hot dogs over an open flame and a good night of rest in the foggy Oregon rainforest, we set out along the beach in search of Emlong's Proterozetes locality - this was my third or fourth visit. After a few hours turned up nothing, I was returning north to meet up with Ash and Lee. Ash indicated he had two things to show to me. The first was a dissappointing lump, which we quickly redeposited on the beach. He nonchalantly pulled out of his windbreaker pocket a second fossil and said "I'm not sure this is anything" - and he placed in my hand a nearly complete sea lion mandible embedded in a concretion! He laughed, knowing full well my reaction would consist of a number of surprising expletives. The specimen was my first successful acid preparation experiment, becoming completely clean after only about 2-3 weeks in 5% acetic. A few years later we decided to write a paper on it, noting that the original paper by Barnes et al. (2006) had never really described the referred mandible collected by Emlong. We worked slowly on the paper after we went our separate ways to Ph.D. programs at UC Berkeley and New Zealand, and it was just finally published earlier this year. 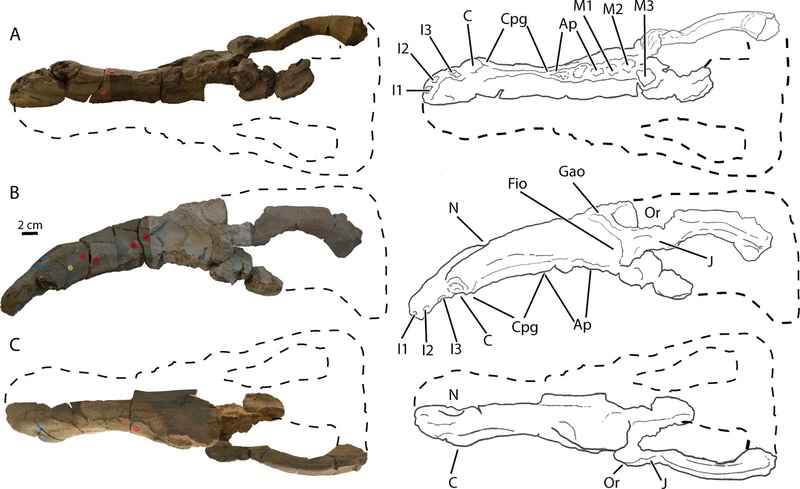 The paper describes the new mandible, provides a much-needed description of the larger referred mandible collected by emlong, and proposes a couple of new autapomorphies for the genus Proterozetes. Prey acquisition and mastication in the "oyster bear" Kolponomos. One of the strangest marine mammals from the Pacific Northwest is the "oyster bear", Kolponomos - originally described in the 1960s by UCMP paleontologist RA Stirton, who initially interpeted it as a giant marine racoon. Subsequent discoveries by Doug Emlong and others revealed complete skulls with mandibles, and a second species - all from the lowermost Miocene of Oregon (Nye Mudstone) and Washington (Clallam Formation). Kolponomos has a skull approximately the size of a black bear, with enlarged sea-otter like teeth and a fused mandibular symphysis; muscle attachments on the back of the skull indicate it had powerful neck muscles. 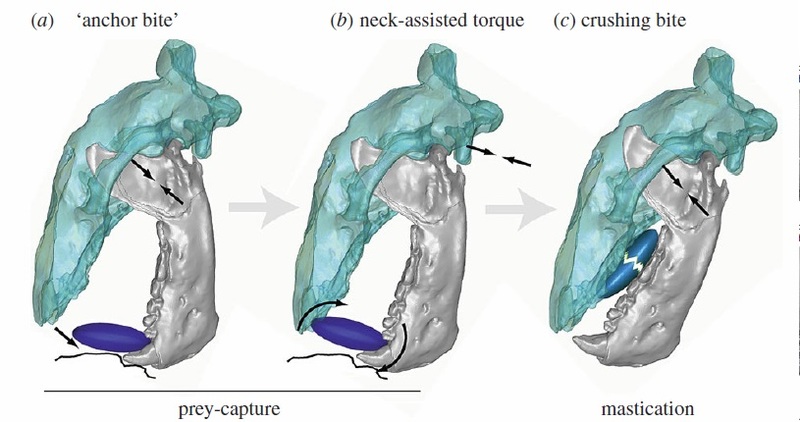 A new paper by carnivore specialist Jack Tseng (et al., 2017) - well-known for his work on hyenas - utilized finite element modeling to study how this carnivore crushed molluscan prey. Unlike sea otters which have tiny, dextrous paws well-adapted for grasping and using tools, Kolponomos apparently had to use its canines and neck muscles to pry mollusks off of hard substrates. Further unlike sea otters, Kolponomos has an unfused mandibular symphysis. 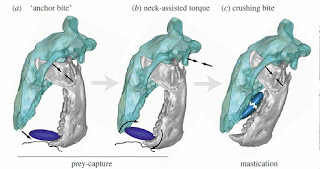 Surprisingly, Kolponomos is similar in biomechanical terms to the jaw-closing system in sabertooth cats like Smilodon. 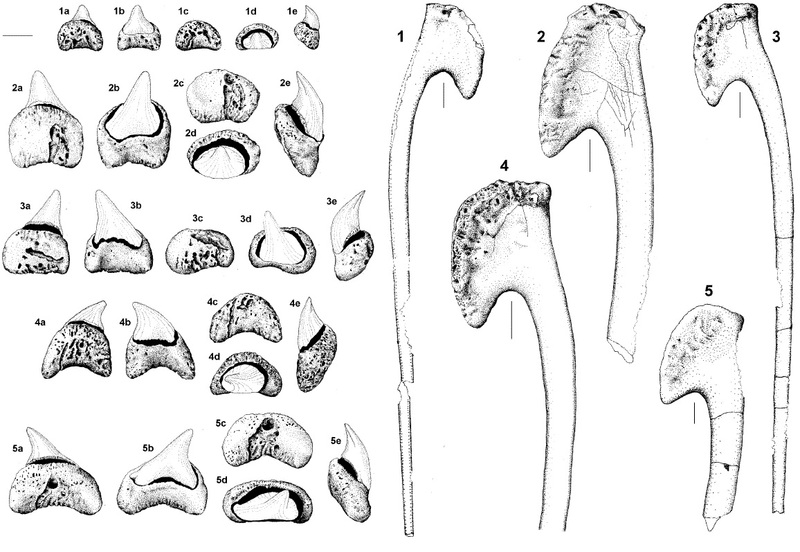 Until 2016, not that much had actually been written about fossil toothed whales from this region, and only a single scrappy specimen was published - a chunk of an odontocete mandible reported by Barnes et al. (2010) from the lower Miocene Nye Mudstone near Newport, Oregon. The fragment consists of the posterior part of a fused mandibular symphysis with a homodont dentition (based on the alveoli), and is rather narrow - leading Barnes et al. (2010) to identify it as a platanistine - a "true" relative of the Ganges river dolphin (Platanista). Few other examples of platanistine fossils exist, and only time will tell if less scrappy evidence of such an early origin for the subfamily is founded. Miocene Nye Mudstone of Oregon. The holotype skull of the allodelphinid dolphin Goedertius oregonensis. However, 2016 saw the publication of a monograph by Toshiyuki Kimura and Larry Barnes on the Allodelphinidae - an enigmatic group of long snouted dolphins in the equally enigmatic clade Platanistoidea. The only extant platanistoid is the Ganges/Indus river dolphin, Platanista gangetica; it is quite weird, and has large bony facial crests that wrap around the melon and house a series of air-filled sinuses. 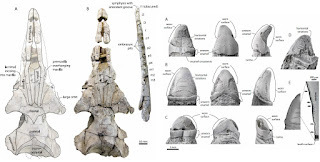 Formerly allodelphinids included only Allodelphis pratti, but this new paper refers the longirostrine dolphin Zarhinocetus errabundus (from Sharktooth Hill, California) to the family and names several new allodelphinids. Chief among these is Goedertius oregonensis - yet another taxon named after Gail and Jim Goedert. This new dolphin was discovered and excavated by the Goederts from the Nye Mudstone in Oregon (earliest Miocene) and it is a rather small, longirostrine dolphin; the earbones remain in place. The Goedertius holotype represents one of the most spectacularly preserved fossil odontocetes from the North Pacific. Another allodelphinid is named in the genus Zarhinocetus - Zarhinocetus donnamatsonae, from the lower Miocene Astoria Formation of Washington state. Holotype skull and life restoration of the bizarre platanistid dolphin Dilophodelphis fordycei (artwork by Alex Boersma). 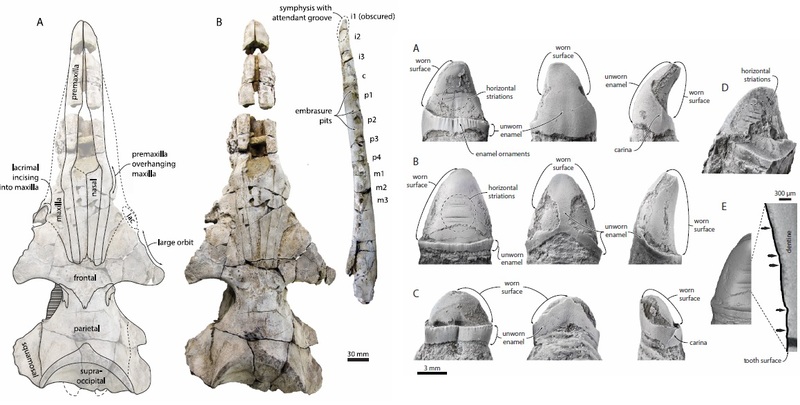 In 2017, student Alex Boersma and colleagues published a new dolphin from the Emlong collection and named it Dilophodelphis fordycei - the specific name after my Ph.D. adviser, Ewan Fordyce (who is fittingly fascinated with the platanistoids) and the genus name after the two large maxillary crests, and a bit of an homage to the dinosaur Dilophosaurus. Dilophodelphis hails from the Astoria Formation near Newport, Oregon, and is early Miocene in age. The cranial crests are large and bulbous and not pneumatized, unlike modern Platanista. This study clarifies some issues in the sequence of cranial evolutionary weirdness within Platanistidae. 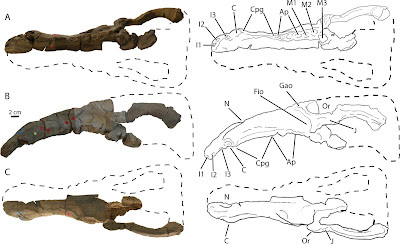 Palatal vascularization and teeth in modern Balaenoptera and Aetiocetus weltoni (top) and a skeletal reconstruction of Aetiocetus (copyright R.W. Boessenecker 2015). The Pacific northwest is well known amongst marine mammal paleontologists for a plethora of early baleen whales, first discovered by Doug Emlong in the 1960s. A later discovered fossil, named in 1995 as Aetiocetus weltoni, is a toothed baleen whale from the early late Oligocene Yaquina Formation near Newport Oregon. Aetiocetus weltoni had a flattened but apparently akinetic palate and rostrum, and was likely about the size of a large bottlenose dolphin. It was originally given a "telegraphic" description with a much longer treatment reserved for later, but was never undertaken. Originally thought to be a mysticete lacking baleen, Deméré et al. (2008) reported the presence of vascular foramina and grooves in the palate of the type specimen and made the daring hypothesis that aetiocetids - or, at least some of them - possessed teeth and baleen. This was followed up by a much more in depth study of the skull, mandible, dentition, and earbones; the postcranial skeleton unfortunately has not been prepared, and whereas it is supposed to be at UCMP, its current whereabouts are unknown. Very recently, another aetiocetid has been described, collected by Jim Goedert from the early Oligocene Makah Formation of the Olympic Peninsula in Washington. 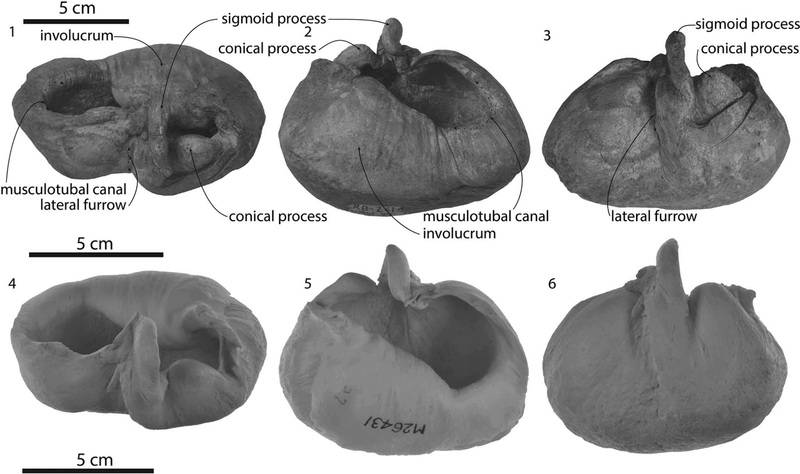 This new aetiocetid, a small bodied (porpoise sized) species named Fucaia buelli, is known from much of a postcranial skeleton and a well preserved braincase with beautiful earbones and several teeth. No palate is known, and thus the presence or absence of baleen is unknown. Fucaia buelli gets its name from the Strait of Juan de Fuca, and prolific (but unfortunately retired) paleoartist Carl Buell. Whereas Aetiocetus weltoni has a near homodont dentition (all teeth look similar), Fucaia buelli still has archaeocete like multicuspate cheek teeth, attesting to some dental diversity within the Aetiocetidae. This study also reclassified Chonecetus goedertorum as Fucaia goedertorum (a taxonomic decision that caused a bit of confusion during my last museum visit with C.H. Tsai, as we habitually referred to the more complete species Chonecetus goedertorum simply as Chonecetus during our Ph.D. program). with the type skeleton (right) from the Makah Formation of Washington. Alfred the aetiocetid whale, with teeth showing signs of toothwear and possible enlarged gums. Yet another new study on aetiocetids was published in 2016, this time a preliminary investigation of feeding behavior and feeding ecology in an undescribed aetiocetid - some sort of critter intermediate in size and morphology between Fucaia and Aetiocetus. Marx et al. (2016) found that this specimen, a skull from the Oligocene Pysht Formation of Washington, has a number of teeth with abrasive toothwear restricted to the tips of the teeth - suggesting that the base of the teeth were embedded in gums. They further interpreted this as evidence that the whale was a suction feeder, and cast doubt on the hypothesis that aetiocetids possessed baleen - increased blood supply to the palate was instead related to thickened gums. It's an interesting study, but it's important to note that there's a big gap in logic between tooth wear and suction feeding - and further important to note that aetiocetids possess no skeletal adaptations for suction feeding. All cetaceans primitively possess the ability to do so, but only some actually exhibit positive evidence for doing so (e.g. shortened rostra, tooth reduction) - neither of which really characterize aetiocetids. Holotype skull of the possible eomysticetid Sitsqwayk cornishorum from the Oligocene Pysht Formation of Washington. Not all mysticetes from the Oligocene of the Pacific Northwest are toothed aetiocetids. Ph.D. student Carlos Peredo and his adviser Mark Uhen (2016) named an eomysticetid-like mysticete, Sitsqwayk cornishorum, from the Oligocene Pysht Formation of Washington. The holotype specimen includes a partial skull and the anterior 2/3 of the postcranial skeleton. 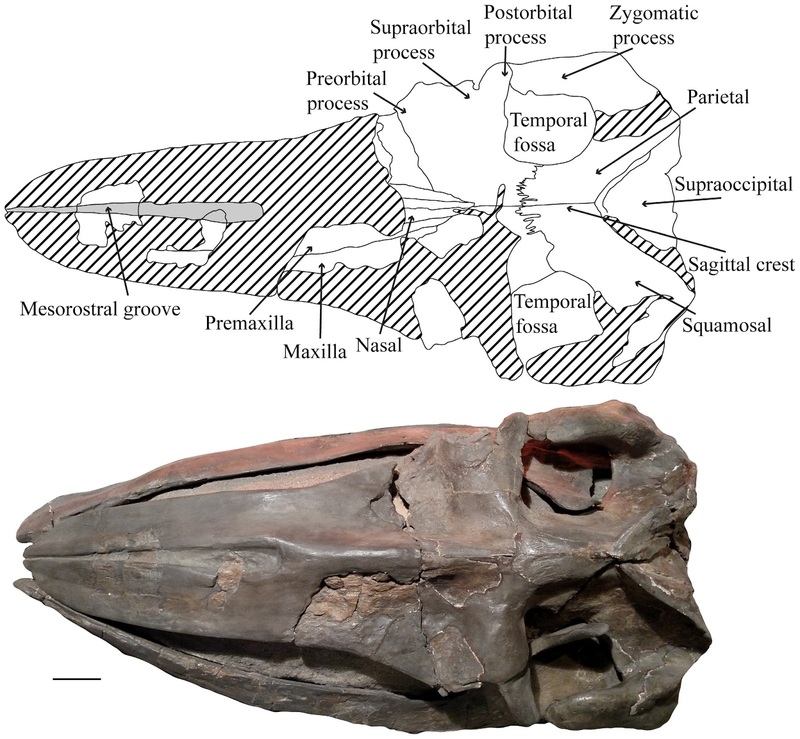 The skull shares a number of features with eomysticetids I had described during my Ph.D. from the Oligocene of New Zealand: limited telescoping, a long intertemporal region, and several features of the squamosal. I suspect better earbones are needed to tell, as cladistic analysis places this taxon one node down the tree - and a large number of cranial characters remain unknown. Surprising range extension of the archaic whale Herpetocetus, as demonstrated by a skull from the Plio-Pleistocene Falor Formation of northern California. 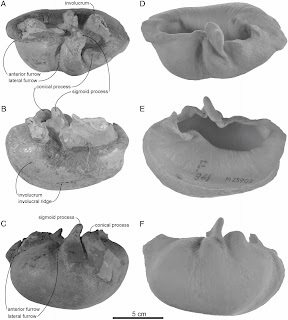 Much more recent baleen whales from the Plio-Pleistocene have also been reported recently. The dwarf baleen whale Herpetocetus has a surprising record from the early-middle Pleistocene Falor Formation of Humboldt County, CA, based upon a partial braincase collected by Ron Bushell and described by yours truly (Boessenecker, 2013). This find extends the geochronologic range of the dwarf mysticete Herpetocetus from the late Miocene and early Pliocene into the Pleistocene, indicating significant temporal overlap with modern species of baleen whales - indicating that Herpetocetus *almost* made it into the modern fauna. Another specimen (also collected by Ron Bushell) from the same age but from the Rio Dell Formation further south in Humboldt County consists of a well preserved tympanic bulla and posterior process. I invited my labmate Cheng-Hsiu Tsai (a mysticete fanatic) to study the specimen, and together we published it last year in Journal of Paleontology. This specimen is identifiable as an anatomically modern gray whale, Eschrichtius sp., cf. E. robustus, and dates to the earliest Pleistocene. Somewhat more archaic gray whales (Eschrichtius sp.) are known from the late Pliocene of Japan. Because Eschrichtius is currently unknown from well sampled Pliocene assemblages, we interpreted the fossil record of Eschrichtius to indicate that it evolved or was present in the western North Pacific in the Pliocene prior to dispersing eastward to the California margin during the Pleistocene. 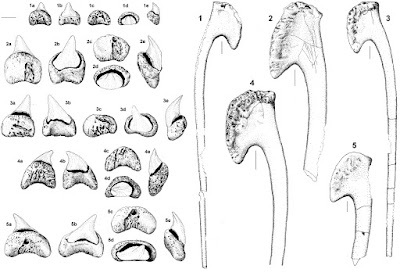 Comparison of Pleistocene Eschrichtius sp., cf. E. robustus from the Rio Dell Formation of California with modern E. robustus. Comparison of Pleistocene fin whale (left, Rio Dell Formation) and modern fin whale (Balaenoptera physalus). Another Pleistocene earbone of a baleen whale was discovered shortly after our paper was published on the Pleistocene gray whale bulla from the Rio Dell Formation. The new specimen consisted of a much larger bulla, from a different locality out on the coast that had received substantially more research attention in terms of stratigraphy, geochronology, and depositional history. The specimen was collected by my good friend Chris Pirrone, an attorney in the San Francisco area; he agreed to donate the specimen for study. I continued preparation, using a combination of acid and mechanical preparation, and invited CH Tsai to study the specimen - and in 2017 the paper was published. 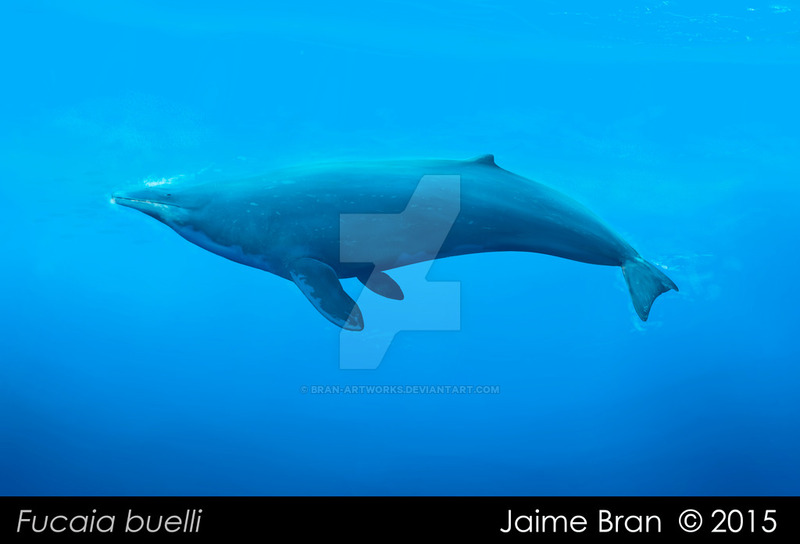 morphologically, the specimen is identical to modern Balaenoptera physalus - the fin whale, the second largest animal to have ever lived, next to the blue whale - albeit slightly smaller in total size. Molecular clock calibration suggests the modern species blue and fin whales diverged in the late Miocene or Pliocene - though we have no fossils indicating such a claim is reasonable. The fact that these two species are capable of interbreeding and have not really been collected from well-sampled Pliocene deposits suggests that their divergence has been overestimated. This information underscores the importance of sampling Pleistocene marine mammal fossils. Well preserved skull of the early desmostylian Cornwallius sookensis from the Oligocene Yaquina Formation of Oregon. Some of the most spectacularly bizarre marine mammals of all time are the desmostylians, nicknamed by some as "sea hippos". Desmostylians are related to sea cows (Sirenia) and elephants (Proboscidea), are hippo-like in build and found exclusively in marine sediments along the margins of the North Pacific (Japan, Sakhalin, Kamtchatka, Alaska, British Columbia, Washington, Oregon, California, Baja California). They have strange teeth composed of cylindrical cusps with some approaching a package of sushi rolls or a six pack of beer cans. Desmostylians come in two flavors: broad-snouted hippo-like mouths and narrow, elongate snouts; both types have short upper and lower tusks. Several recent papers have greatly improved our knowledge of the oldest known desmostylians from North America. The first reports additional unpublished material collected from the type locality of Cornwallius (Beatty, 2006), consisting of a pair of femora rediscovered in Smithsonian collections. The second study (Beatty, 2009) reported new skulls and mandibles of the poorly known desmostylian Cornwallius sookensis, previously known only from isolated teeth from the late Oligocene Sooke Formation of Vancouver Island. This new material (collected by Doug Emlong, of course) reported revealed that Cornwallius had an unusally elongate, narrow snout. The most primitive known desmostylian, Behemotops, was originally based upon two species: Behemotops emlongi (characterized by wide mandible and enormous tusk) and Behemotops proteus (characterized by narrow mandible). Each was erected based on a single specimen, and in 1994, a third specimen that was morphologically intermediate led the original authors to synonymize both into Behemotops proteus. 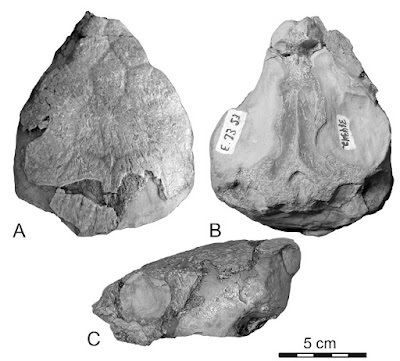 New material of Behemotops proteus from the late Oligocene Sooke Formation reported by Beatty and Cockburn (2015) includes most of a skull and quite a bit of the postcranial skeleton. The snout is very elongate and narrow, similar to Cornwallius. This discovery highlights the disparate anatomy of the broad-mouthed Behemotops emlongi, which is apparently different enough to warrant placement in a separate genus as Seuku emlongi - its relationships remain unclear. The bizarre skull of the primitive desmostylian Behemotops proteus from the Oligocene Sooke Formation of British Columbia. Barnacle covered sea lion bones (Proterozetes) from the Pleistocene Port Orford Formation of Oregon. Occasionally bones with interesting preservational features are discovered. One such discovery was made by yours truly while hiking along a desolate foggy coastline in southwestern Oregon back in 2008 when I spotted a couple of bones poking out of a low cliff; I didn't have any of my normal supplies as I was on a road trip at the time, but quickly carved the two bones out of the cliff and wrapped them in newspaper. A returned to my car soaking wet, and continued my drive south. When I got home to sunny San Francisco, I put the two bone-bearing lumps of sediment onto my driveway and started to douse them with a water hose; after a few minutes I noticed that barnaces were poking out. I looked closer, and they were attached to the bone! A few months later at MSU I had cleaned off the remaining stubborn matrix - I had two associated thoracic vertebrae of a sea lion (middle Pleistocene) completely encrusted with barnacles. The extent of the barnacles indicated that the bones must have rolled around a bit. Previous reports of barnacle encrusted bones had been mentioned with the significance of a footnote and never figured - but a significant amount of data could be gleaned where nobody bothered to look before. (note: this is the same locality as Proterozetes above, and these discoveries were made a couple years before Ashley Poust's mandible was found). Aetiocetid teeth from the Oligocene Pysht Formation of Washington with Osedax boreholes. A more exciting series of finds were the first reports of damage caused by bone-eating worms - boreholes and cavities excavated by the annelid worm Osedax within bones of Oligocene cetaceans (Kiel et al., 2010). These had been widely reported since 2005 in whale falls, and predicted to be present in fossils but so far never reported. Micro-CT scans permitted 3D models of the borings to be produced. Later on, similar borings were also reported from bird bones (Kiel et al., 2011) and then from fish bones and aetiocetid teeth (Kiel et al., 2013). 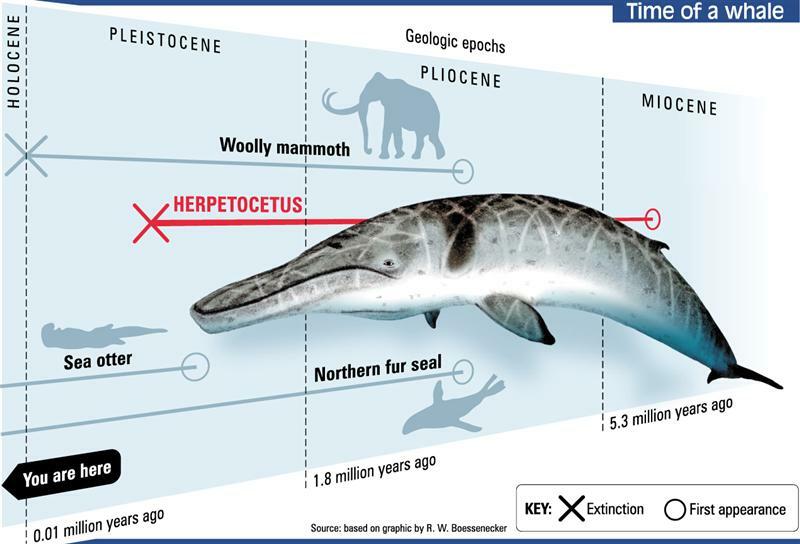 These discoveries indicate that processes which biologists have found affecting modern cetacean skeletons on the seafloor have had a serious (yet unquantified) effect on the marine vertebrate fossil record. Notably, these sorts of bone modifications are not yet reported for younger Neogene marine vertebrates from the west coast and appear to be restricted to the Paleogene. After a lag in research output in the late 1990s and early 2000s, it seems that serious scientific attention is again being redirected at these important fossil collections and localities from the Pacific northwest. The sheer majority of these fossils have been collected by a few unnaturally talented individuals, and while a large number of unprepared specimens at various institutions in the US (Burke Museum, Washington; Smithsonian NHM, Washington DC; Los Angeles County Museum, California) await preparation, new efforts are needed to explore critical yet under-studied localities such as the Empire and Port Orford Formations of Oregon and the Eel River Basin of California. 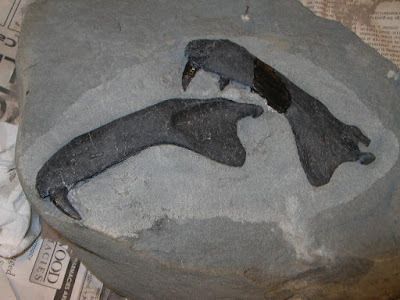 Many new projects have been started and research effort in the Pacific Northwest is likely at an all time high - research is actively being undertaken upon fossil sharks and fish (E. Popov, B. Welton), birds (G. Mayr), sea turtles (K. Awalt, P. Holroyd, J.F. Parham), sea otters (R. Boessenecker), pinnipeds (R.W. Boessenecker, M. Churchill, A. Poust), cetaceans (R. Boessenecker, E. Fitzgerald, E. Fordyce, F. Marx, M. Nelson, T. Park, N. Pyenson, C. Peredo, C.H. Tsai, M. Uhen, J. Velez), and sirenians (R. Boessenecker, J. Velez). The future is bright! Barnes, L.G., C.E. Ray, and I.A. Koretsky. 2006. A new Pliocene sea lion, Proterozetes ulysses (Mammalia: Otariidae) from Oregon, U.S.A.; pp. 57–77 in Z. Csiki (ed. ), Mesozoic and Cenozoic Vertebrates and Paleoenvironments: Tributes to the Career of Prof. Dan Grigorescu. Bucharest, Romania. Barnes, L.G., T. Kimura, and S.J. Godfrey. 2010. The evolutionary history and phylogenetic relationships of the superfamily Platanistoidea. pp. 445-488 in Ruiz-Garcia, M. and J. Shostell (eds). Biology, Evolution, and Conservation of River Dolphins. Nova Science. Beatty, B.L. 2006. Rediscovered specimens of Cornwallius sookensis (Mammalia: Desmostylia) from Vancouver Island, British Columbiam Canada. PalArch's Journal of Vertebrate Palaeontology 1:1-6. Beatty, B.L. 2009. 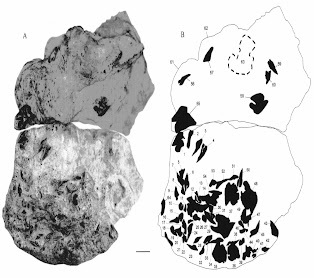 New material of Cornwallius sookensis (Mammalia: Desmostylia) from the Yaquina Formation of Oregon. Journal of Vertebrate Paleontology 29:894-909. Boersma, A.T., McCurry, M.R., and N.D. Pyenson. 2017. 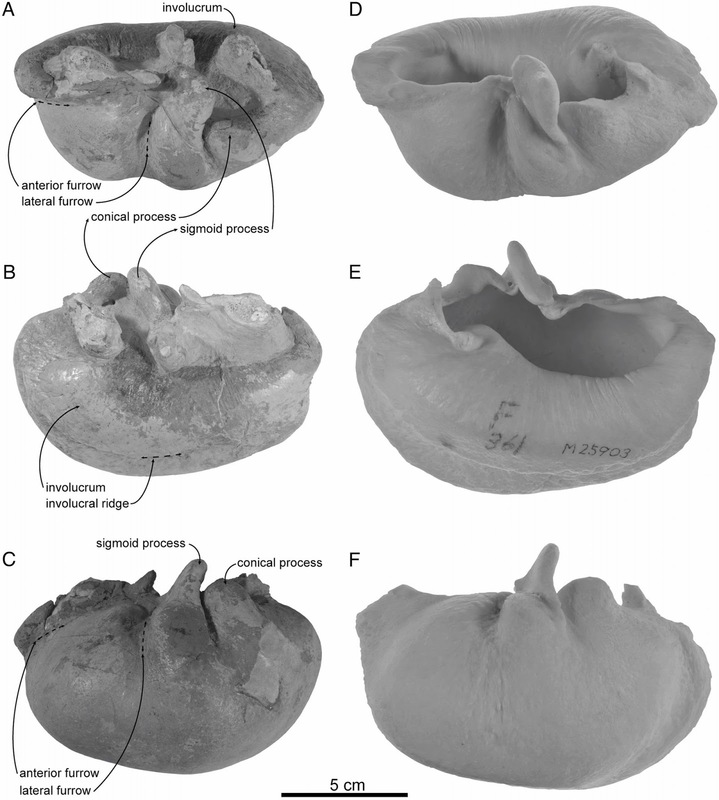 A new fossil dolphin Dilophodelphis fordycei provides insight into the evolution of supraorbital crests in Platanistoidea (Mammalia, Cetacea). Royal Society Open Science 4:170022. Boessenecker, R.W. 2011. 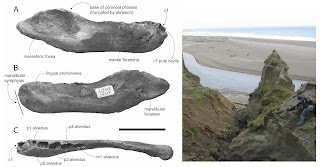 New records of the fur seal Callorhinus (Carnivora: Otariidae) from the Plio-Pleistocene Rio Dell Formation of Northern California and comments on otariid dental evolution. Journal of Vertebrate 31:454-467. Boessenecker, R.W. 2013. Pleistocene survival of an archaic dwarf baleen whale (Mysticeti: Cetotheriidae). Naturwissenschaften 100:365-371. Brinkman, D.B. 2009. A sea turtle skull (Cheloniidae: Carettini) from the lower Miocene Nye Formation of Oregon, U.S.A. Paludicola 7:2:39-46. Cullen, T.M., D. Fraser, N. Rybczynski, and C. Schroder-Adams. 2014. Early evolution of sexual dimorphism and polygyny in Pinnipedia. Evolution 68:5:1469-1484. Deméré, T.A., and A. Berta. 2008. 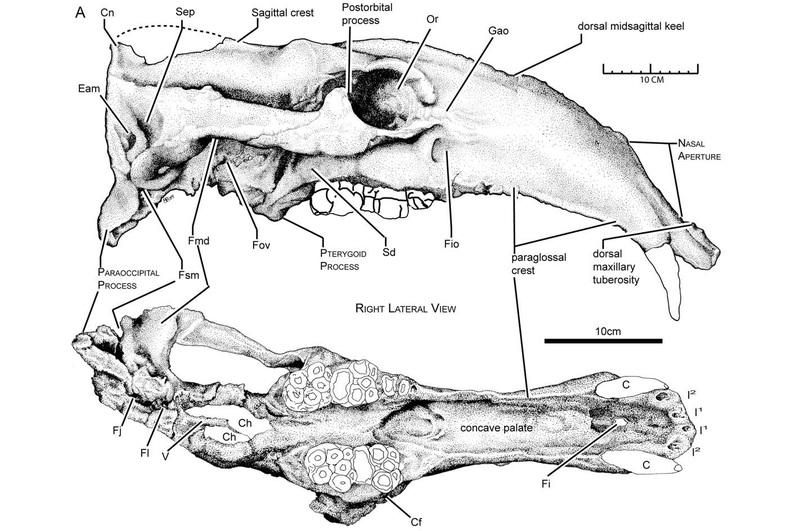 Skull anatomy of the Oligocene toothed mysticete Aetiocetus weltoni (Mammalia; Cetacea): implications for mysticete evolution and functional anatomy. Zoological Journal of the Linnean Society 154:308-352. Deméré, T.A., M.R. McGowen, A. Berta, and J. Gatesy. 2008. Morphological and molecular evidence for a stepwise evolutionary transition from teeth to baleen in mysticete whales. Systematic Biology 57:1:15-37. Dyke, G.J., X. Wang, and M.B. Habib. 2011. Fossil plotopterid seabirds from the Eo-Oligocene of the Olympic Peninsula (Washington State, USA): descriptions and functional morphology. PLoS One 6:10:e25672. Fierstine, H.L. 2005. A new Aglyptorhynchus (Perciformes: Scombroidei) from the Lincoln Creek Formation (Late Oligocene, Washington, U.S.A.). Journal of Vertebrate Paleontology 25:2:288-299. Kaiser, G., J. Watanabe, and M. Johns. 2015. A new member of the family Plotopertidae (Aves) from the late Oligocene of British Columbia, Canada. Palaeontologia Electronica 18:3:52A:1-18. Kiel, S., J.L. Goedert, W.A. Kahl, and G.W. Rouse. 2010. 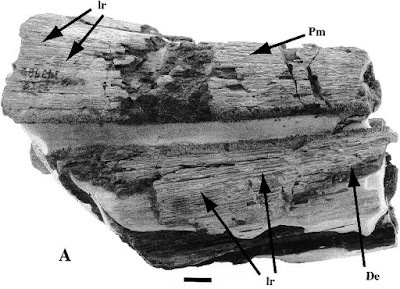 Fossil traces of the bone-eating worm Osedax in early Oligocene whale bones. Proceedings of the National Academy of Sciences 107:8656-8659. Kiel, S., W.A. Kahl, and J.L. Goedert. 2011. Osedax borings in fossil marine bird ones. Naturwissenschaften 98:51-55. Kiel, S., W.A. Kahl, and J.L. Goedert. 2013. Traces of the bone-eating annelid Osedax in Oligocene whale teeth and fish bones. Palaontologische Zeitschrift 87:1:161-167. Kimura, T., and L.G. Barnes. 2016. New Miocene fossil Allodelphinidae (Cetacea, Odontoceti, Platanistoidea) from the North Pacific Ocean. Bulletin of the Gunma Museum of Natural History 20:1-58. Marx, F.G., C.H. Tsai, and R.E. Fordyce. 2015. A new early Oligocene toothed 'baleen' whale (Mysticeti: Aetiocetidae) from western North America: one of the oldest and the smallest. Royal Society Open Science 2:150476. Marx, F.G., D.P. Hocking, T. Park, T. Ziegler, A.R. Evans, and E.M.G. Fitzgerald. Suction feeding preceded filtering in baleen whale evolution. Memoirs of Museum Victoria 75:71-82. Mayr, G. 2015. A new Paleogene procellariiform bird from western North America. Neues Jahrbuch für Geologie und Paläontologie 275:11-17. Mayr, G., and J.L. Goedert. 2017. Oligocene and Miocene albatross fossils from Washington state (USA) and the evolutionary history of North Pacific Diomedeidae. The Auk 134:659-671. Mayr, G., J.L. Goedert, and S.A. McLeod. 2013. 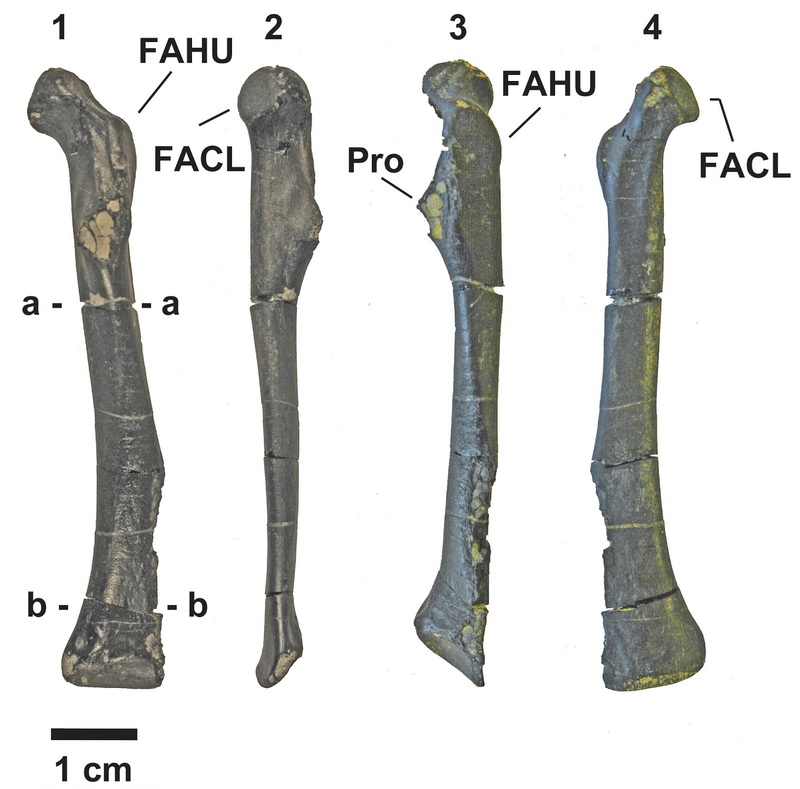 Partial skeleton of a bony-toothed bird from the late Oligocene/early Miocene of Oregon (USA) and the systematics of Neogene Pelagornithidae. Journal of Paleontology 87:5:922-929. Mayr, G., J.L. Goedert, and O. Vogel. 2015. Oligocene plotopterid skulls from western North American and their bearing on the phylogenetic affinities of these penguin-like seabirds. Journal of Vertebrate Paleontology 35:4:e943764. Peredo, C.M., and M.D. Uhen. 2016. 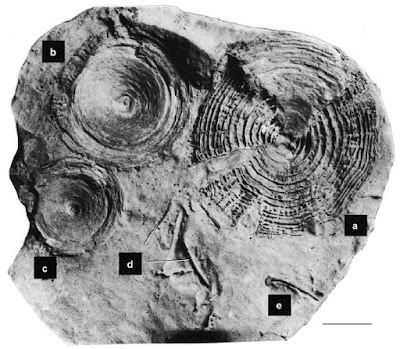 A new basal chaeomysticete (Mammalia: Cetacea) from the late Oligocene Pysht Formation of Washington, USA. Papers in Palaeontology 2:4:533-554. Shimada, K., B.J. Welton, and D.L. Long. 2014. A new fossil megamouth shark (Lamniformes, Megachasmidae) from the Oligocene-Miocene of the western United States. Journal of Vertebrate Paleontology 34:1-12. Tsai, C.H. and R.W. Boessenecker. 2015. An early Pleistocene gray whale (Cetacea: Eschrichtiidae) from the Rio Dell Formation of northern California. Journal of Paleontology 89:103-109. Tsai, C.H. and R.W. Boessenecker. 2017.The earliest-known fin whale, Balaenoptera physalus, from the early Pleistocene of Northern California, U.S.A. Journal of Vertebrate Paleontology 37:2:e1306536. Tseng, Z.J., C. Grohe, and J.J. Flynn. 2016. A unique feeding strategy of the extinct marine mammal Kolponomos: convergence on sabertooths and sea otters. Proceedings of the Royal Society B 283:20160044. Welton, B.J. 2013a. A new archaic basking shark (Lamniformes: Cetorhinidae) from the Late Eocene of western Oregon, U.S.A., and description of the dentition, gill rakers and vertebrae of the Recent basking shark Cetorhinus maximus (Gunnerus). Albuquerque: New Mexico Museum of Natural History and Science Bulletin 58:1-48. Welton, B.J. 2013b. Cetorhinus cf. C. maximus (Gunnerus) (Lamniformes: Cetorhinidae), a basking shark from the Late Miocene Empire Formation, Coos Bay, Oregon. Bulletin of the Southern California Academy of Sciences 112:74–92. Welton, B.J. 2015a. A new species of late early Miocene Cetorhinus (Lamniformes: Cetorhinidae) from the Astoria Formation of Oregon, and coeval Cetorhinus from Washington and California. Natural History Museum of Los Angeles County Contributions in Science 523:67-89. Welton, B.J. 2015b. The marine fish fauna of the middle Pleistocene Port Orford Formation and Elk River Beds, Cape Blanco, Oregon. New Mexico Museum of Natural History and Science Bulletin 66:1-45. Welton, B.J. 2016a. A new dalatiid shark (Squaliformes: Dalatiidae) from the early Oligocene of Oregon and California, USA. New Mexico Museum of Natural History and Science Bulletin 74:289-302. Welton, B.J. 2016b. First report of Orthechinorhinus (Squaliformes: Etmopteridae) from the Pacific basin; a new species from early Oligocene rocks of Oregon, USA. New Mexico Museum of Natural History and Science Bulletin 74:303-308. I'm a paleontologist and adjunct faculty at College of Charleston in South Carolina, with research interests in Cenozoic marine vertebrates with an emphasis on marine mammals (whales, dolphins, pinnipeds, otters, sea cows, and others), but I willingly entertain brief distractions into the worlds of marine birds, sharks, and fish. My M.S. (2011, MSU-Bozeman) focused on marine vertebrate taphonomy whilst my Ph.D. (2015, U. Otago, NZ) focused on Oligocene baleen whales from New Zealand. Current research is concerned with fossil cetaceans from South Carolina including Oligocene eomysticetids, toothed mysticetes, and archaic dolphins. Digging up our Triceratops: Count Trikeula! Aquatic Amniote Reboot - coming soon!